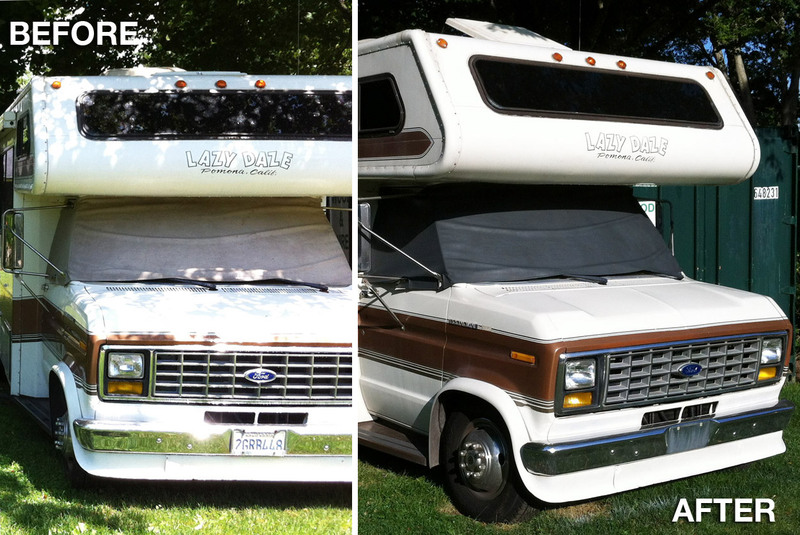 Don't Replace Your RV Windshield Covers, ReNew It With Vinyl Spray Paint! 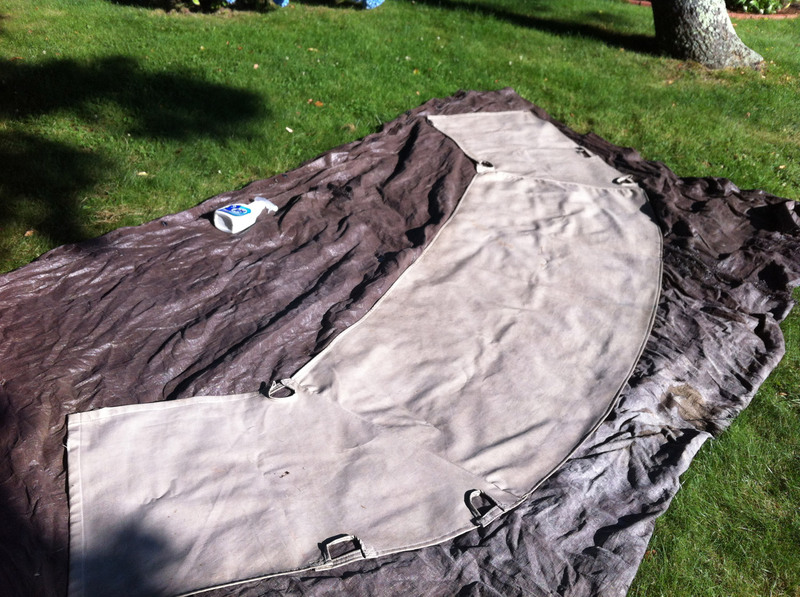 Don’t Replace Your RV Windshield Cover, ReNew It With Vinyl Spray Paint! Spray paint products are quickly becoming our new best friends as we repair, upgrade and fine tune our ol’ motorhome. Our home on wheels may be tiny but, the parts and pieces are made up of a large and exciting variety of materials. So, after a bit of research from bumper to windshield cover, we’ve found that handy-dandy and very inexpensive spray paint is the answer. So What Is Wrong With Our RV Windshield Cover? This windshield cover came with our RV from the previous owner. It is a custom fitted cover with clips that fasten onto our front cab doors. The top is vinyl and the underside is insulated with a heavy cotton fabric. A fine piece indeed, except for the nasty, yellow stains and discoloration from years of use and abuse. This photo does NOT do the real nastiness justice! Several times we’ve tried to clean it using all sorts of scrubs, removers and cleaners. Finally, after looking into a new replacement of this cover and finding out that a half as good ‘replacement’ is about fifty bucks, we searched for a plan B. This is what turned up, RustOleum Fabric and Vinyl spray paint. A can of vinyl spray paint is only 6.99 and this project took two cans. For fourteen bucks our windshield cover is like new again! Now, for the environmentally concerned, we get it. The aerosol cans and toxic fumes are enough to send any conscious person running for the hills. However, besides being an inexpensive, durable cover-all product, it makes ‘old’ things reusable again. So instead of replacing our 25 year old, very well made, insulated, and fitted windshield cover, we re-newed it! Of course, we could have skipped this upgrade all together. However many of the RV mods that we’ll be working on, shouldn’t be skipped. Projects such as the rusty underside of the RV – bumper to bumper, and so on. Making spray paint an option to consider when replacement is too expensive or unavailable. What do you think of the environmental impact of buying new vs. the use of spray paint products? Let us know which you would choose. Looks great! I think you two did a great job and went about it the smart way. We recently refinished our 40 year old (gross) shower pan using a fiber glass kit instead of buying a brand new one, worked like a champ. Oh, good to hear. We might need to do the same to our shower?